In a headline move for the industry of online streaming-specifics, set-top box provider Boxee have become the property of South Korean technology giants Samsung for an estimated price of $30m. Given the money being transferred for technological properties in recent times, the Israeli start-up may have a right to feel a little short-changed on the deal given the amounts that circulate their rivals in set-top box streaming, but it would have presumably been a fair price agreed upon in the terms of the deal, which are currently undisclosed. Boxee, who through a spokesperson confirmed they were becoming a ‘part of Samsung’ yesterday (3 July), are notable for being a ‘DVR’ service that allows users to store content through cloud technology for limitless viewing space-wise, whilst also allowing the user to stream content wherever they are via a range of devices. For 6-year-old Boxee, meanwhile, the takeover will join a total of $27m raised in previous funding from the likes of Spark Capital and Softbank NY, but could the support from Samsung offer much more than financial security when it comes to their ongoing development? 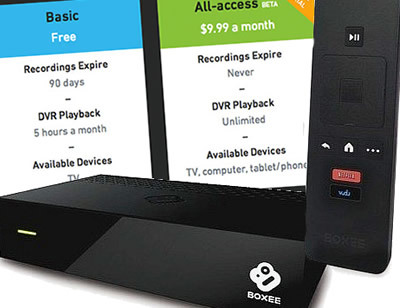 The Boxee TV streaming set-top box costing $99.99 has been rebranded as the Boxee Cloud DVR, offering a free DVR service into the service bundle offered. Buyers of Boxee Cloud DVR will now receive streaming TV, live TV and a rather mean 5 hours of cloud DVR playback monthly. If you wish to pay for the $9.99 per month “all-access” Cloud DVR service then your recordings are stored indefinitely. The Cloud DVR service is available in eight major cities Atlanta, Chicago, Dallas, NYC, Philadelphia, Houston, Los Angeles and Washington D.C. They promise further coverage is being introduced soon across the USA. The new Boxee service streams video and music from a number of apps that include Netflix, YouTube,Vudu, MLB.TV, Pandora, and Spotify, among others. It also gives access to OTA live TV from broadcast TV channels such as ABC, CBS, CW, FOX, NBC, PBS and Univision. Using the DVR function, users can watch and playback this content on a number of connected devices such as computers, smartphones and tablet computers. Fans of heavy metal can start rocking out on November 15th, as Heavy Metal Television finally goes live on what will become a fateful day in November for the up-start 24/7 live streaming metal television station. The station, which will be streamed 24 hours a day in high definition video and audio will bring back the classic MTV format from yesteryear–and provide viewers with all of the metal and alternative rock music videos and news they can handle. All viewers will need to do is have access to the internet to receive the feed, and for those with an internet connected television set or set-top-box will find pointing your web browser to the appropriate web page extremely easy. The 24/7 streaming network will provide conceptual videos presented by video jockeys, or VJ’s as they were called in the early days of MTV. Fans of metal and alternative rock will be able to see videos from older generations including Judas Priest and Iron Maiden, while fans of newer metal bands like Five Finger Death Punch and Shinedown will also be entertained. All one needs is an internet connected device to enjoy the channel, which will stream content live 24 hours a day. Advertising will be inserted directly into the streams via motion graphic advertisements–similar to those used on YouTube and other video-streaming sites. 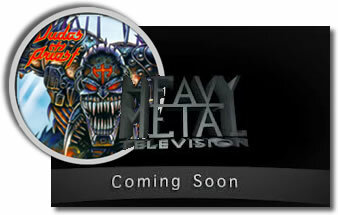 Come November 15th hard rock and metal fans take note to direct your web browsers (on any device) to www.HeavyMetalTelevision.com and enjoy the new channel. Boxee have released details of the new internet TV set-top box that offers a whole lot more. The new Boxee TV will sell for a very attractive $99 and includes a whole raft of TV watching options that cover every base. Want internet streaming TV? It’s covered. HD TV from a tuner? Check. An unlimited DVR? Gotcha. It seems on the face of it, a very attractive package andpromises a box that has something for everyone. The feature list is pretty big, so we will look at each one individually. Firstly the DVR which Boxee call a “No Limits” DVR, works by storing an unlimited number of your recordings in the cloud which can then be accessed using a Wi-Fi or Ethernet connection. You can access your recordings from any web browser on a number of devices from your television, smartphone or tablet PC. This service will cost though, taking a sizeable $15 per month from your pocket. 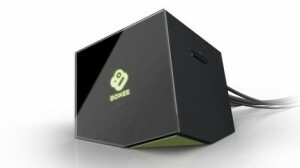 For traditional TV viewers, the Boxee TV has an in-built antenna to receive over the air broadcasting from channels such as Fox, NBC, ABC, and CBS. Also included is a cable input for on the back to receive basic cable channels. For streaming internet TV, the Boxee TV comes with several services pre-installed, including Youtube, Netflix, Vudu and streaming radio from Pandora. To help navigate the online TV services, the Boxee remote control has had a makeover and features dedicated buttons for Netflix and Vudu as well as a QWERTY keyboard. Price of the new Boxee TV will be $99 at launch on November 1. The Boxee set-top-box is said to be getting an upgrade that is currently going through testing, and the device isn’t quite like anything currently available on the market. The new media streaming receiver is being designed to pick up live local television signals and adds DVR functionality to sweeten the deal. According to technology site the Verge, manufacturer D-Link is utilizing over-the-air live television, DVR, and web apps to create a brand new media streaming solution for consumers. It should be noted that users will need access to a television antenna to pick up the signals. The form factor is conventional, sleek and should appeal to more than cord-cutters who are looking for ways to get free DVR functionality for local television stations. Beta testers also have received a survey that seems to hint at the possibility of the Boxee set-top-box being able to stream video across devices, allowing users to watch recorded content on their mobile or tablet computing devices. The small black box comes with a television tuner and there is some debate on whether it will have it’s own antenna or not. If the device does not come with a built-in antenna receiver, connecting one to the device would not be too difficult for most users. A four-way directional controller-remote allows users to easily navigate menus on the device. 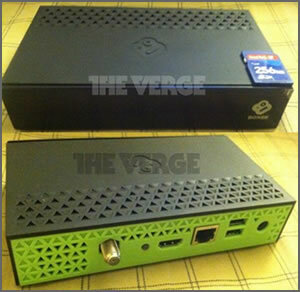 The new Boxee set-top-box is said to be still in a prototype state, and no release date details have been disclosed.